The Jamberoo White Horse Cup team, aka the Jedi Cowpats, are off to Moss Vale this Sunday to contest the final of the White Horse Cup. The team is set to play Gibraltar Golf Club, a team full of big-hitting low markers. It will be a stern test for our team but they do have the ‘Force’ on their side. Col Booth, the captain of the team, has asked if any Jamberoo members would like to come up to Moss Vale and act as caddies. If you can you will be most welcomed (and included somewhere in the match report). Hit-off is at 10 am. It has been confirmed this week that Oaks Automotive will sponsor the Jamberoo Open Ambrose Championship. The event will be held on Saturday June 29 and the format will be a 4 person elimination Ambrose. This process continues up until the ball is on the putting green, and then all four players have the opportunity to sink the putt. The eliminated player cannot take a practice shot during the time they are eliminated. Cost of entry to the event will be $80 per team ($20 each player) and it will be open to all players from Jamberoo Golf Club and those from any Golf Illawarra club. There will be a $400 per team first prize for best nett and $400 per team for the best gross score. Second to fifth best nett teams will also win a prize. A monster drive will be awarded in three grades as well as nearest the pins and a super shot. In total $2000 of prizes will be awarded. Put this date in your calendar and start getting your team together. Please take a few moments to complete the members survey and return it to the box in the Members’ Lounge. Your opinions are valued greatly so please have your say. I am pleased to welcome our newest members to the club, Rod and Glenys Harding, Phil and Gloria Thompson and Claire Graham. You will be playing one of the most beautiful courses on the NSW south coast. Enjoy golf the way you want it and never fight for a tee time and you will enjoy the benefits of membership, including access to all club competitions and unlimited use of the course for practice and social golf. Jamberoo are the defending champions and will be hosting a round of the Shield on Monday April 8. Play will commence from 8 am from the 1st, fifth and 10th tees. Good luck to our team in defence of the Shield. We are still waiting for the old balances for both ball and trophy accounts to be entered into the new golf management software by the company who installed it. All prizes awarded from March 12 are there and available for your use. The office has records of your old account balances and you can access them during office hours. The Board of Directors has also requested that all members use their ball credits before the end of this financial year. Failure to do so will result in them reverting to the club as per the 2019 conditions of play [see page three of the programme booklet]. Only a few competitions were held this week and still some very good scores were achieved. Tony Rodriguez is back in form in A grade with 39 points, Brian Bennett in B grade, with the days best of 41 points, Dennis Thomas in C grade with 40 and Pat Travers in D grade with 40. The Just Bathrooms Fourball winners were Brian Bennett and Les Hanigan with 48 points. On Saturday the conditions were very variable with firstly rain and then windy weather. Wayne Arnott was the A grade winner with 40, Chris Leckey, using his ‘right hand swing, left hand putt’ technique was the B grade runner up with 38 pts after Mick Burton who scored a very nice 40 points. In C Grade Laurie Fogarty was the clear winner with 41 points and Phil Hahn was the countback winner on 38 over both Phil Lewis and Phil Hellmund. D grade winner was Les Farkas on a countback over Don Roberts. The Kingsford Nine was very popular this week with 13 entries. Pat Travis was the winner with 26 points, which included 3 bonus points. A Business will have the rights to this top spot in the golfers lounge. The fee will be for 5 years. JGC will organise a sign of your choice. If you know someone who is interested please contact Sue Paul –office has details. First in best dressed. Board Members and starters thanked Alan for the many years spent volunteering in the starters area at Jamberoo Golf Club. Alan has retired (at 84) from the regular starters group roster. No more rising at 4am to have the course open by 6am. Having reached a low mark of 2 in the 1990s he regaled many a golfing story. Joan had many a tale as well. Please thank him when you next see him—a valuable asset to our club. Alan will still be assisting from time to time. This Saturday will revert to an individual stableford for both Men and Women. The match committee apologises for the late change. The bookings already made will still stand. Ben Churchill and his wife Elsie came to Jamberoo from Crookwell where they had had some experience with the “sand greens” golf course. To maintain their interest in golf, Ben and Elsie, along with Eric Gardner and Curly Irvine formed a Social Golf Club, the members of which played monthly on Southern Highlands Golf Courses. From this experience, the members of the Social Golf Club were keen to see a Golf Course at Jamberoo, and with the sale to the Council of the Tate farm adjacent to the town, an opportunity was seen to enable this to happen. Elsie and Ben grasped it with both hands, instigating the necessary representations. Following some opposition, the Golf Club was formed and the area now occupied by the Golf Course was leased to, and subsequently purchased by, the Golf Club. From that time, and in the early years, all the development and maintenance work was done by volunteers, many of them from the farming community using their own equipment until the Club was in a position to purchase plant. On many occasions, farmers were seen working on the Golf Course while their wives were home doing the milking. In 1981 the Club was able to open the Course with three sand greens. This progressed to 13 sand greens which were gradually replaced by grass greens and extended to eighteen holes in the nineties. These early volunteers were totally responsible for the development and maintenance of the Golf Course during the period before the Club had a paid curator/groundsman, and then continued assisting through the period before and after a full complement of ground staff was employed. Foremost among these volunteers was Ben Churchill, who, while still in the workforce, was a regular after work and at weekends and who, after retirement, along with others in the same position as himself formed a team dubbed “Dad’s Army” which was on deck daily tending to the Course. Their contribution to the Course and Ben’s knowledge of the design and watering arrangements was invaluable to the Club. Since Ben stopped playing competition golf he was regularly seen playing social rounds with his good friend Laurie Walton. 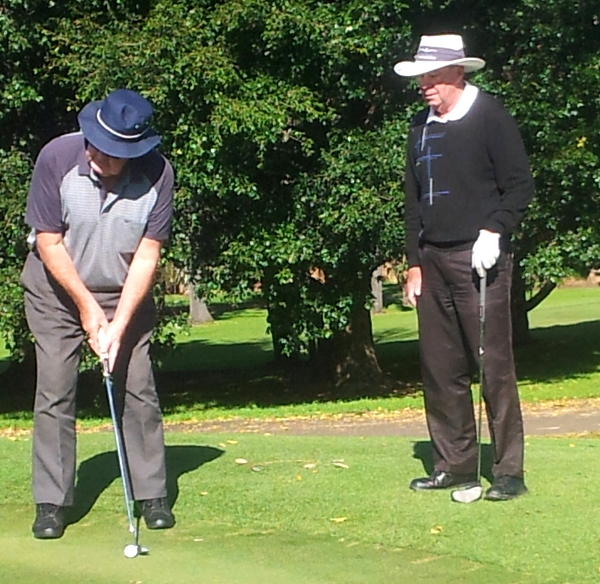 Vale Ben Churchill – a dedicated volunteer for the Jamberoo Golf Club.